This pink sleepover party was for girls only. It looked like everything was sprayed with Pepto-bismol! Charli (the girl having the party) went totally ABOVE & BEYOND!! She had pillows & blankets laid out for everyone to sleep on, and they were all pink. Charli had all these movies that had to do with girly girls, like Legally Blonde. Then the cake, OMG, was the best thing I've ever seen! 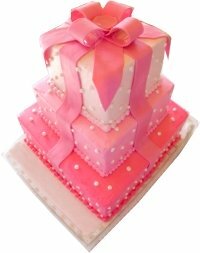 It was a 5 layer cake, and every layer had a different design, like one layer was different shades of pink polka dots. It was the BEST girly party I've ever been to!! Could it be a purple sleepover. I loved the pink but, I love purple!!!!!!!!!!!!!!!!!!!!!!!!!!!!!!!!!! We had a scavenger hunt, like the pink panther and the detective. We later watched all the pink panther cartoon episodes and did a pedicure with pink paw prints on the big toe! My Fave Party Theme - A Pink Patt-ayy! !